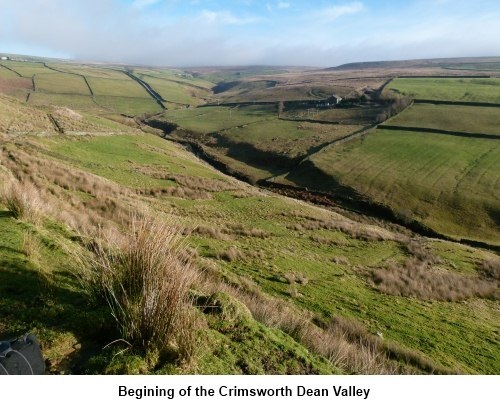 Introduction: This walk could include Hebden Bridge but this would add another 4 miles if you wanted to do it. It skirts Wadsworth and Shackleton Moors above Hebden Bridge. 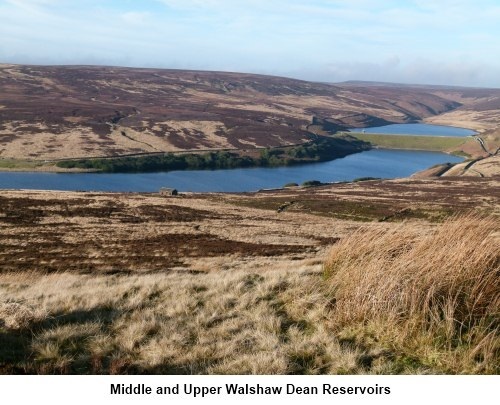 The walk takes you along the ancient route from Haworth to Hebden Bridge, passing picturesque reservoirs, the pretty Crimsworth Dene and returns via Top Withins (of Bronte fame). As indicated by my traffic lights above there are no major ascents/descents and much of the route utilises broad moorland tracks. The first part of the walk takes you through Penistone Country Park. To get to Cemetery Road, pass through Haworth westwards towards Stanbury. Immediately the houses finish, there is a left turn which is Cemetery Road. The lay-by is on the right, just past the turn for Dimples Lane. 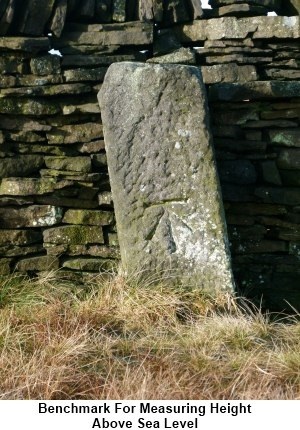 Opposite the lay-by is a finger post to Penistone Hill which indicates the start of the walk (SE 021371). Start: Climb the short rise and at the top, and turn right on to the broad track indicated by two “little green man” waymarkers with the numbers 34 and 27 (ignore the narrower track going downhill). At the next broad track, turn right (SE 022367). Stay on this track and ignore a track to the right signposted Top Withins. At the crossroad of broad tracks, carry straight on (signposted Oxenhope). When you get to the road, turn left and almost immediately turn right opposite Westfield Lodge signposted Bronte Falls and Top Withins (SE 018362). There is another waymarker number 34. Go just past the farm and climb over the stile and turn left (SE 015389). You come to another farm and continue straight on downhill on the broad farm track. 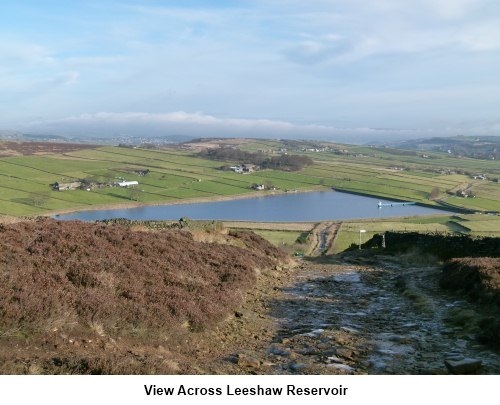 Leeshaw Reservoir is to your right. At the end of the track, go over the cattle grid and turn right, heading towards the reservoir. Skirt round the end of the reservoir dam and the track swings to the left heading in a south westerly direction. Stay on this track ignoring any footpaths off to either side. After 1.7 miles, the track becomes a metalled road and at the bottom of the dip to a stream, just by the bridge, turn right on the bridleway signposted Calder Aire Link Pennine Bridleway 4 miles (SD 995324). Continue along this broad track until you reach a substantial derelict farmhouse on the right (SD 989314). You need to go straight on but there is a track to the right which will shorten the walk should you want to do so and cuts about 2.5 miles off the overall walk coming out at Walshaw. This is shown on the sketch map as the “Short Cut” in green. The track now descends slightly alongside one of the prettiest sections down Crimsworth Dene. This is particularly attractive in autumn. As the track splits into two at a fork, bear right. There are two “Turning Ahead” signs for vehicles (you approach them from the back) and there is a wooden bench (SD 987299). The track now gently curves in a clockwise direction and passes through a group of buildings including Rose Cottage. Below to your left is the valley in which Hebden Bridge sits. At the next farm, the track forks and you take the right hand fork. At the next junction, take the right hand fork. You come to Walshaw. Be careful here as you want the second of the two right hand turns, the one immediately next to Walshaw Lodge (SD 974314). 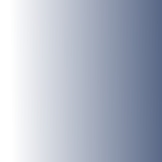 If you had taken the short cut, this is where you would emerge. The track bends left by an entrance to the wonderfully named “Horrodiddle” (the OS map only spells it with one ‘R’) and at the next farm, turn right (SE 975316) and stick to the track with a wall on your left. It then becomes a walled lane for a short distance. At the end of the walled track, pass through the gate or climb the stile where there is a large sign for “Walshaw and Lancashire Moor.” Turn right here off the main track and follow the narrow footpath on to the moors. This footpath reaches a broad track. Cross straight over it on to another broad track and continue straight ahead across the moor. 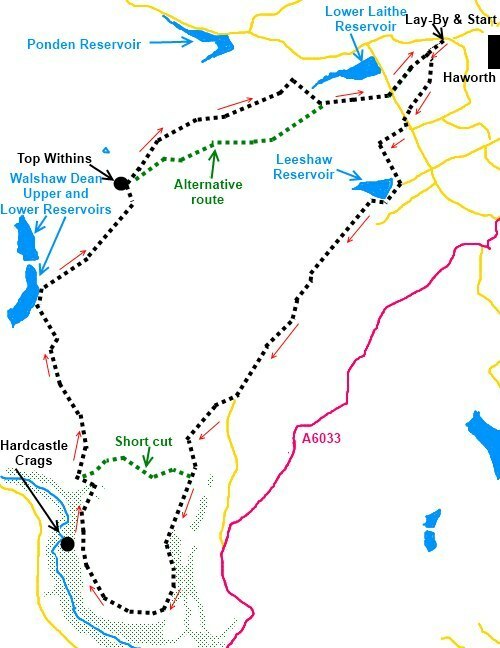 The incline levels out and descends with Upper, Middle and Lower Walshaw Dean Reservoirs ahead. Pass a small stone building on the right of the track at a bend and shortly after this take the slightly less distinct but still broad track which branches off to the right heading towards the middle reservoir. At the gate, go through (SD 969337) to the land adjacent to the reservoir. Turn right and cross the bridge heading towards the gate you can see. Ignore the sign to the left signposted Pennine Way and signs for upper Walshaw. Follow the signs for Top Withins. Pass through this gate and turn off to the right rising up the moor signposted Pennine Way (SD 970339). Much of this track has been stone paved to prevent erosion especially as you get closer to Top Withins. In the distance to the right are numerous windmills. 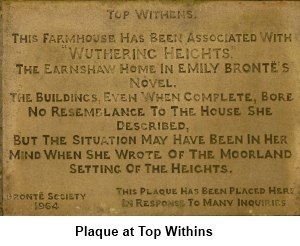 As you crest the brow of the hill, Keighley is in the distance at about 2 o’clock and ahead to the left are the ruins of Top Withins of Bronte fame although as you will see when you read the stone plaque, there is no certainty this fame is justified but it has become something of a pilgrimage for lovers of the Bronte books. 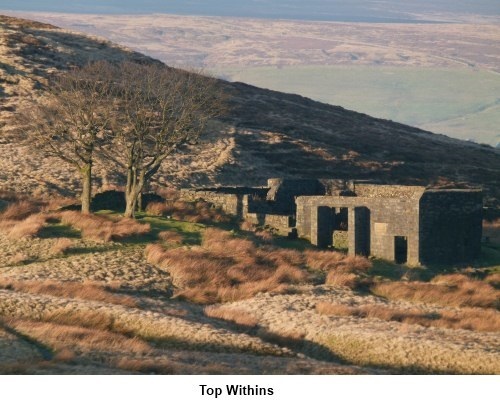 Just past Top Withins are the ruins of another building (SD 981353). Here a track branches off to the right past the Bronte Waterfalls and this is perhaps the conventional way back. It is shown on the sketch map by the green “Alternative Route”. However unless there has been heavy rain, these are probably worth a miss and this walk stays higher for longer to get better views. Continue straight ahead ignoring the Bronte Waterfall sign. The stone flags double up to provide a vehicle track. At the farmhouse (camp site) turn left, signposted Stanbury and Haworth. Continue down the lane and look out for a very high stone stile in the wall (SE 002365) as you approach Lower Laithe Reservoir. Climb over this and go down the field and over another stile when the ground slopes steeply away down to a pretty stream which feeds the reservoir. Cross the footbridge, turn right and climb the bank at the other side to another stile. Climb this and walk up the field on the other side bearing towards its top left hand corner where there is a ruined farmhouse. Go over the ladder stile by the ruin and turn left on a broad track. Go straight across the road and you are back on Cemetery Road. The lay-by where you started is a few hundred yards along on the left.